Halophytes are salt-resistant or salt-tolerant plants that thrive and complete their life cycles in soils or waters containing high salt concentrations. Despite high salt content in the tissues of halophytes, they can be grown and harvested as food or animal fodder. Salts are ionic molecules that typically dissolve in water and split into cations (positively charged ions) and anions (negatively charged ions). Rain dissolves salts from minerals in rocks and soil. These dissolved salts then either enter surface waters or percolate down to an aquifer. 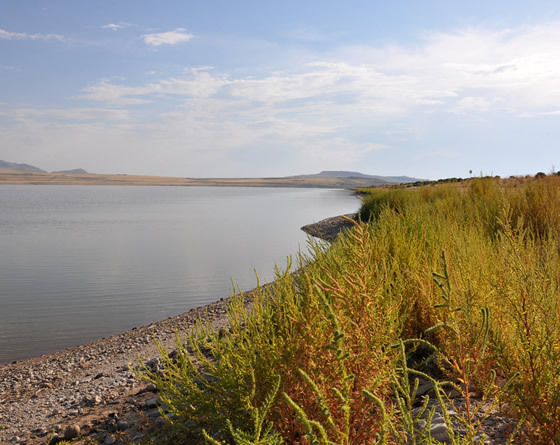 In arid regions where there is low rainfall, water evaporates quickly, leaving its salt load behind, leading to the development of saline soils, salt lakes, and brackish groundwater. Even in areas that are only moderately arid, excessive irrigation can cause soil salinity to rise with time, which can lead to loss of agricultural lands, because most crop plants tolerate very little salt in the soil. White, powdery, or crystalline residues coating the ground are indications of especially heavy salt accumulation. Most plants can tolerate salts at very low levels, but many cannot live in soils or water with high concentrations of salts. The salts in saline areas are often dominated by sodium chloride, forming sodium and chloride ions in water. High concentrations of these ions prevent the growth of glycophytes, salinity-intolerant plants. Glycophytes grow only in areas with fresh water containing less than 125 parts per million of soluble salts. Halophytes can be true halophytes or semi-halophytes; both can thrive in areas with slightly to highly saline water containing soluble salts of 125 to 5,000 parts per million. Only the true halophytes can survive in areas with excessively saline water, containing greater than 5,000 parts per million soluble salts. The concentration of soluble salts is about 850 parts per million in Colorado River water and about 35,000 parts per million in seawater. Movement of water between soil and plants occurs by osmosis. Water moves from an area of low solute concentration (low salt concentration) to an area of higher solute concentration. A common measure of the tendency of aqueous solutions to “attract” water is called osmotic potential. The osmotic potential of pure water is zero, which means that when coming into contact with water containing solutes, pure water will move into it. The osmotic potential of water with solutes is always expressed as a negative number, and the higher the concentration of solutes, the more negative the osmotic potential. Therefore, the osmotic potential in plants and growth media (water and soil) is always more negative than that of pure water. The osmotic potential in plants must always be more negative than the osmotic potential in soils, so that water can move from soil into the cells of plant roots. If large concentrations of soluble salts are present, as in saline or excessively fertilized soils, osmotic potential in the soil becomes more negative than in plants, causing water to move from roots to soils. As a result, glycophytes wilt and die, while halophytes possess adaptations that enable them to survive. Many halophytes are considered facultative halophytes, indicating that they can grow in saline and nonsaline habitats. Others are obligate halophytes which can survive only in a saline environment. Some Salicornia species (pickleweed, for example) cannot survive under freshwater conditions. Although some halophytes can grow normally in nonsaline soils, they are less abundant than glycophytes, suggesting that they may compete poorly with glycophytes in nonsaline environments. Some halophytes require fresh water for germination, whereas others readily germinate in saline environments. Some germinate only during the rainy season, to take advantage of the relatively low salt concentration. Seed germination in the goosefoot family (Chenopodiaceae) is unique in that the hypocotyl (the stem between the cotyledons and the radicle), rather than the radicle (or embryonic root), emerges first. After the lower tip of the hypocotyl touches the soil, the radicle begins to emerge. The roots are ready to tolerate the salts, storing the absorbed salts in the hypocotyl tissues. In saltbush (Atriplex), germination is regulated by storing salts in the seed coat, and the developing embryo is desalinized in the seed. In mangroves (Avicennia and Rhizophora species), seeds mature without undergoing dormancy and germinate while the fruit is still attached to the mother plant, which provides water and nutrients during germination. A seedling on the mother tree produces a long hypocotyl. This heavy hypocotyl causes the mature seedlings to fall on the mud, where they continue to mature. Resistance of halophytes to salt stress involves two different adaptations: salt tolerance, which involves accumulating salts in the plant’s cells, and salt avoidance, which involves adaptations to minimize the concentrations of salt in the cells or adaptations to bar salts from entering through plant roots. These two adaptations have led to the designations “salt accumulators” and “salt excluders,” respectively. Salt accumulators absorb salts throughout the growing season, resulting in an increase in salt concentration in the cells and thus maintaining a water potential that is more negative than that of the soil. The difference in osmotic potential between plant cells and soil water forces the water to enter the cells by passing through the cell membrane via osmosis. Water in leaf cells escapes as vapor through pores, or stomata, a process called evapotranspiration. Evapotranspiration also helps move water from the roots up the stem to the leaves. Salt accumulators, such as saltbush (Atriplex), smooth cordgrass (Spartina alterniflora), saltgrass (Distichlis spicata), and tamarisk (Tamarix petandra), have specialized cells called salt glands located on the surfaces of their leaves, used for storing excess sodium chloride. As the glands fill with salt they eventually burst, releasing salts that form a crystalline coating on the leaves. The crystals fall or are dissolved by rain, which returns the salt to the soil. Other halophytes can accumulate and concentrate the salts in their cells up to a certain toxic concentration, at which point the salts cause the plant to die. Some salt accumulators avoid salt stress by minimizing salt concentration in the cytosol of their leaf cells. Leaf cells regulate cytosolic salt levels by transporting sodium and chloride ions into the central vacuole. A high salt concentration in the vacuole causes it to take up more water and swell. As the water-filled vacuole pushes the cytosol toward the cell membrane and cell wall, the cell maintains its turgidity, typical of succulent halophytes, such as pickleweed (Salicornia virginica). Some salt excluders avoid salt stress by defoliation or abscission (leaf release). When cytosolic salt concentrations approach toxic levels, excess sodium chloride accumulates in petioles, stems that connect leaves to the main stem). The petiole, including the leaf, dies and then detaches from the stem, dropping to the ground. The removal of salt-concentrated parts desalinates the plant, thus preventing buildup of sodium and chloride ions to toxic levels. Other salt excluders avoid salt toxicity at the roots. The root epidermis (outer layer of cells) of some halophytes may not allow the passage of sodium and chloride ions through the cell membrane. Roots also have an endodermis (inner layer of cells) that contains waxy strips surrounding each cell, to obstruct the entry of sodium and chloride ions. Although this mechanism is less common, selective permeability of the cell membrane (the transport of other ions rather than sodium and chloride ions) into the roots of halophytes is possible. In some plants, root cells are capable of actively pumping excess sodium and chloride ions out into the surrounding soil. In arid regions, farmers often use groundwater to irrigate their crops. Even when salt concentrations in the groundwater are relatively low, salt can gradually accumulate in the soil as a result of high evaporation rates in these areas. Eventually, such soils become so salinized that most traditional crop plants cannot survive. Growing halophytes as crops could be a way to use salinized soils. Also, as the human population increases and fresh water becomes an expensive commodity, irrigating halophytes with saltwater could be away of conserving fresh water. 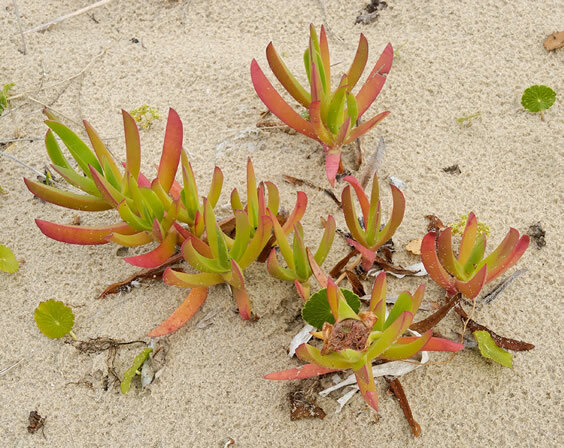 Some halophytes growing in deserts, estuaries, and seashores are potential sources of food, fuel, and forage. 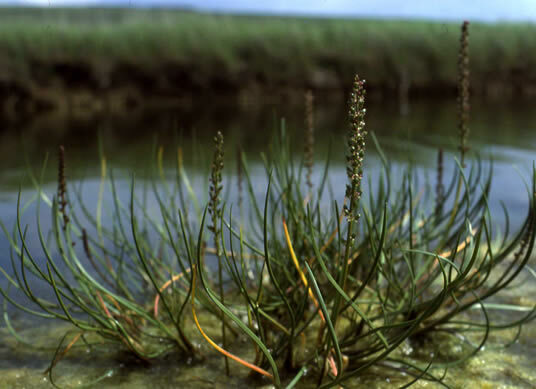 The seeds of eelgrass (Zostera marina) and saltgrass could be ground to make flour. Seeds of Salicornia species are a potential source of vegetable oil. Halophytic trees, such as mangrove, could be harvested for wood and fuel. Eelgrass and saltbush could be used as forage for livestock. Common reed (Phragmites australis) is a marsh plant used since ancient times for roofing and making baskets. Coconut palms (Cocos nucifera), found in occasionally inundated shorelines, yield oil from the nuts. Traditional uses of the coconut palm include weaving leaflets into baskets and mats, converting husks into charcoal, and using fibers to make brushes and mats. Other halophytes could be sources of waxes, gums, and pharmaceuticals.